INO.com Trader's Blog - Expert analysis, charts, trading tips and videos. A very interesting price pattern is setting up in the financial sector that could lead to a very big move in the US and Global markets. Remember how in 2008-09, the Financial sector and Insurance sector were some of the biggest hit stock sectors to prompt a global market crisis? Well, the next few weeks and months for the financial sector are setting up to be critical for our future expectations of the US stock market and global economy. Right now, many of the financial sector stocks are poised near an upper price channel that must be breached/broken before any further upside price advance can take place. The current trend has been bullish as prices have rallied off the December 2018 lows. Yet, we are acutely aware of the bigger price channels that could become critical to our future decision making. If there is any price weakness near these upper price channel levels and any downside price rotation, the downside potential for the price is massive and could lead to bigger concerns. Hello traders everywhere. The NASDAQ hit a record high of $8,052.40 in early trading as market sentiment was lifted by stronger-than-expected corporate earnings and solid economic data out of China. China's economy grew at a steady 6.4% pace in the first quarter, defying expectations for a further slowdown, adding to optimism that the economy may be starting to stabilize even as Beijing and Washington appear moving closer to a trade deal. 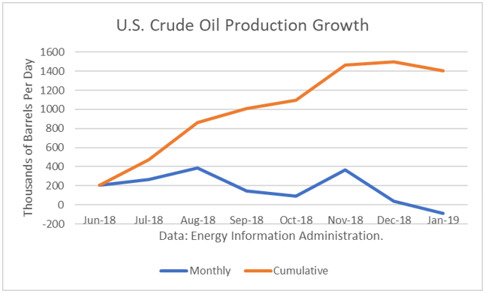 The Energy Information Administration reported that January crude oil production averaged 11.871 million barrels per day (mmbd), down 90,000 b/d from December. Despite the drop in January, crude production still rose by a spectacular 1.407 mmbd from June through January, a period when capacity takeaway constraints had been expected to slow down the growth in Texas. Back in February, I wondered: “How Far Could Crude Oil Go?” As this commodity confirmed the upside reversal breaking above $54.6. We are still living in a “PetroWorld” therefore the price of oil is crucial, and it impacts all of us around the globe. So, we should watch it carefully. 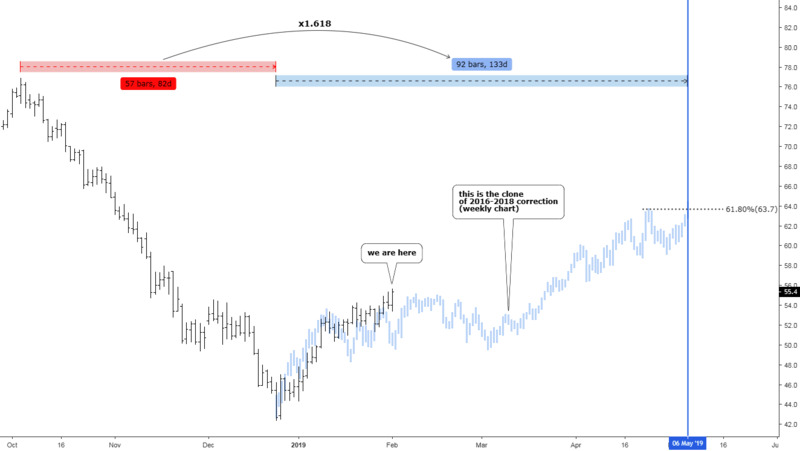 I spotted a structural similarity on the weekly chart, which was cloned and applied to the current pullback of oil price on the lower time frame daily chart. The price target was set at the $63.7 and the time goal was set on the 6th of May, 2019. Before we move on to the updated daily chart, I would like to show you the results of your ballot on this topic. I can’t express all my gratitude for your voting activity and support of my experiments. The results in the diagram above show that you also saw the area above $60 as a target for the current pullback. It is yet early to say if the price has topped already, but our initial target was achieved and even was passed over ahead of time.